India’s relationship with Israel is slowly but surely changing for the better. In recent days, India has reached out to its Middle Eastern partners in a major way. Last week, External Affairs Minister Sushma Swaraj went to Bahrain to attend the first ministerial meeting of the India-Arab League Cooperation Forum. This was an opportunity to engage with the 22 member countries of the Arab League at a time when the region is going through a major crisis and sectarian divisions are rearing their heads like never before. Further cementing the goodwill generated by the visit of Indian President Pranab Mukherjee to Israel and Palestine some three months ago, Swaraj also visited Israel and Palestine. Her visit has paved the way for a possible visit by Israeli Prime Minister Benjamin Netanyahu to India later this year and it is also likely that Prime Minister Narendra Modi may pay a return visit to Tel Aviv. A hallmark of the Modi government’s foreign policy has been a self-confident assertion of Indian interests. This is reflected in his government’s moves vis-à-vis Israel, marking a distinct break from the unnecessary and counterproductive diffidence of the past. Despite sharing 24 years of diplomatic ties and working closely on defense, counterterrorism, agriculture, and energy-related issues, no Indian prime minister or president had visited Israel until Mukherjee’s visit last year. There has been a steady strengthening of India’s relationship with Israel ever since the two established full diplomatic relations in 1992. It is a tribute to Prime Minister Narasimha Rao’s foresight that he was able to lay the foundation of the Indo-Israeli partnership. 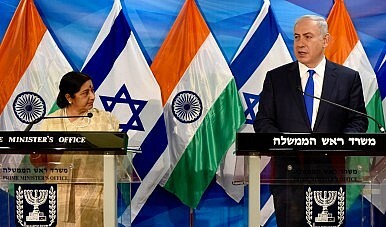 In contrast to the back-channel security ties that existed before the normalization of bilateral relations, India has been more willing in recent years to carve out a mutually beneficial bilateral relationship with Israel, including deepening military ties and liaising on countering the threat terrorism poses to the two societies. Over the years, the Indian government has toned down its reactions to Israel’s treatment of Palestinians. India has also begun denouncing Palestinian suicide bombings and other terrorist acts in Israel, something that was seen earlier as rather justified in light of the Israeli policies against the Palestinians. India is no longer initiating anti-Israel resolutions at the United Nations and has made serious attempts to moderate the Non-Aligned Movement’s (NAM) anti-Israel resolutions. This re-evaluation has been based on a realization that India’s largely pro-Arab stance in the Middle East has not been adequately reciprocated and rewarded by the Arab world. India has received no worthwhile backing from Arab countries in the resolution of problems it faces in its neighborhood, especially Kashmir. There have been no serious attempts by the Arab world to put pressure on Pakistan to reign in the cross-border insurgency in Kashmir. On the contrary, Arab nations have firmly stood by Pakistan, using the Organization of Islamic Cooperation (OIC) to build support for Islamabad and jihadi groups in Kashmir. If Arab nations, such as Jordan, have been able to keep their traditional ties with Palestine intact while building a new relationship with Israel, there is no reason for India not to take a similar route, which might give it more room for diplomatic maneuvering in the region. In fact, it was recently revealed that since the beginning of 2014, representatives from Israel and Saudi Arabia have had five secret meetings to discuss a common foe, Iran. Though Saudi Arabia still doesn’t recognize Israel’s right to exist and Israel has yet to accept a Saudi-initiated peace offer to create a Palestinian state, this has not prevented the two from working together to thwart a strategic threat that they both feel strongly about. Keeping India’s wider strategic interests in perspective, successive Indian governments since the early 1990s have walked a nuanced line between expressing genuine concern for the Palestinian cause and expanding its commercial and defense ties with Israel. India is the world’s largest buyer of Israeli weaponry and was Israel’s third largest trading partner in Asia, just after China and Hong Kong. Israel has been a good friend to India, but New Delhi continues to be shy of demonstrating its friendship. At crucial times, when India needed Israeli help, it got it unreservedly. Israel was willing to continue and even step up its arms sales to India after other major states curbed their technological exports following India’s May 1998 nuclear tests. Israel provided India with much-needed imagery about Pakistani positions using its UAVs during the Kargil War with Pakistan in 1999. That was ultimately instrumental in turning the war around for India. When India was planning to undertake a limited military strike against Pakistan in June 2002 as part of “Operation Parakram,” Israel supplied hardware through special planes. The terrorism that both India and Israel face comes not only from disaffected groups within their territories; it is also aided and abetted by neighboring states, increasingly capable of transferring weapons of mass destruction to terrorist organizations. And yet previous governments had been reticent in acknowledging Israel’s partnership. In diplomacy, public affirmation of friendships at the highest levels is often as important as drawing red-lines for adversaries. The Modi government is doing well by repudiating the discredited Israel policy of its predecessors. An open relationship with Israel serves India well and it’s about time Tel Aviv gets the recognition it deserves from New Delhi. Sushma Swaraj’s visit has made it clear that even as India will try to balance its commitments vis-à-vis Israel and Palestine, New Delhi and Tel Aviv will continue to work toward forging a more robust partnership that spans across various sectors and is not one-dimensional. India must maintain diplomatic equilibrium between Israel and Arab states.